Finally Serato has released Pitch ‘n Time Pro for current versions of Pro Tools. With support added for Avid Pro Tools 10 / 11 users as well as Apple Logic X (64-bit), an updated user interface and some minor feature additions. Current Pitch ‘n Time Pro users can upgrade to 3.0 for only $99 and Pitch ‘n Time LE users for only $49. For first time users, Pitch ‘n Time 3.0 is available this month at the introductory price of $479 for Pro and $239 for LE. Trackpad/mouse-wheel navigation in graphical modes. Now picks up the Pro Tools session BPM. Supported in Pro Tools 10.3.5 and 11. Supported for Mac OS X 10.6.8, 10.7 and 10.8. Windows 7 SP1 and 8. Find out more about Pitch ‘n Time Pro. Download the new version of Pitch ‘n Time Pro. Supported in Logic Pro 9 and X (64-bit inclusive). Supported for Windows 7 SP1 and 8. Find out more about Pitch ‘n Time LE. 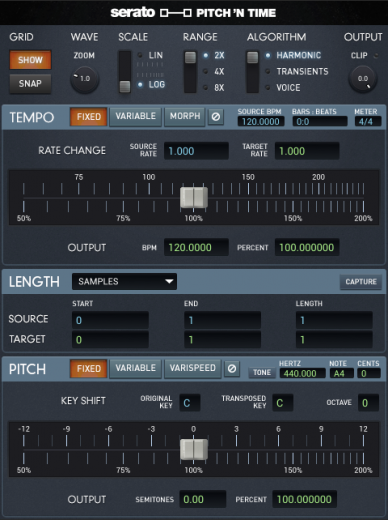 Download the new version of Pitch ‘n Time LE. Your existing Pitch ‘n Time serial numbers will not work with the latest version of Pitch ‘n Time. You will need to upgrade your existing license though the products page of your user profile. • Sign in to Serato.com (be sure to use the account that is linked to your iLok account). • Visit your Serato user account products page. • Click the “Show Serial Numbers and Licenses” button at the top of the product list. • Click the “Upgrade to Pitch ‘n Time X.X” button next to your existing Pitch ‘n Time serial number and confirm you want to do this. • You will now be directed to the Serato store with the upgrade already added to your shopping cart. • Fill out the required customer billing details. • After your transaction is approved, you will receive an email confirming the transaction shortly followed by another email containing your upgraded Pitch ‘n Time license. • Return to your products page. • Your new Pitch ‘n Time license should appear highlighted for you. You will no longer have access to your old Pitch ‘n Time serial number on Serato.com (although it will still be available on your iLok account). • Authenticate this license with iLok as necessary.